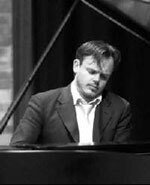 Described by Gramophone magazine as possessing ‘the enviable gift to turn almost anything he plays into pure gold’, Ashley Wass is the only British pianist to have won First Prize at the London International Piano Competition and is also a former BBC New Generation Artist. His recent surveys of piano music by Bridge and Bax have been heralded as ‘unmissable’ and ‘the yardstick against which all future recordings will be judged’. Ashley Wass has given recitals at most of the UK’s major venues and also appeared in a gala concert at Buckingham Palace to mark the Queen’s Golden Jubilee, a performance broadcast live to millions of viewers around the world. Concerto performances have included collaborations with Sir Simon Rattle and the CBSO, London Mozart Players, Philharmonia, Bournemouth Symphony and all the BBC orchestras. Ashley is also much in demand as a chamber musician and has toured the USA and Europe with violinist Sarah Chang appearing at venues such as Philadelphia’s Kimmel Center and Carnegie Hall in New York. He has appeared in the ‘Rising Stars’ series at the Ravinia Festival in Chicago and spent three summers as a participant at the Marlboro Music Festival.